The date is November of 1961. This is a eastern-facing view of San Bernardino Avenue at Texas Street in Redlands, and the Redland Heights Citrus Company. 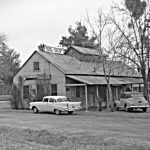 From photographer Robert Gaddie: Pacific Electric’s freight business in Redlands was, essentially, non-existent. After rail passenger service was discontinued in 1936 the Redlands line was cut back to Sunkist. Sunkist was located at San Bernardino Avenue and Texas Street. This was the location of the Redlands Heights packinghouse. This view looks east down San Bernardino Avenue. The packing house is on the left. Note the refrigerator car spotted at the building. In later years the P. E. changed the name of this station to Redlands. During the passenger era the track continued east in the center of the road. At Orange Street the track made a right turn and went to downtown Redlands. 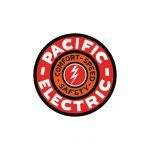 From Facebook commenter C. Mark Sublette: I remember bicycling past this point in the summer of 1971 and seeing a Southern Pacific end-cab switcher working the spur. The PE would have continued up San Bernardino Avenue into the center distance and then turned right onto Orange Street to stub end in downtown Redlands. 2.07 miles of track were lifted when PE service into town ended in 1936. This point on the line was known as Sunkist. I think this photo is misidentified. Perhaps this is the end of the PE line after 1936 northwest of Redlands (known as Sunkist on the later PE maps). This photo was taken in a rural area and does not show a car barn which would have been in town. 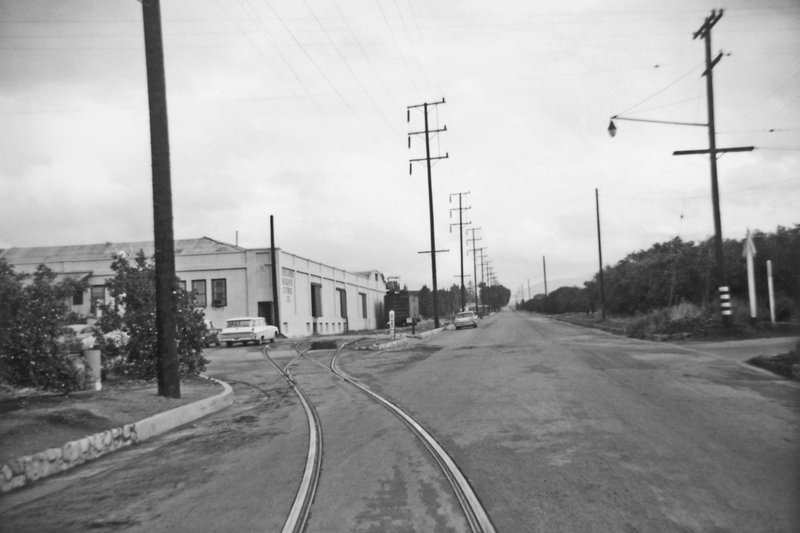 Pacific Electric’s freight business in Redlands was, essentially, non-existent. After rail passenger service was discontinued in 1936 the Redlands line was cut back to Sunkist. Sunkist was located at San Bernardino Avenue and Texas Street. This was the location of the Redlands Heights packinghouse. This view looks east down San Bernardino Avenue. The packinghouse is on the left. Note the refrigerator car spotted at the building. In later years the P. E. changed the name of this station to Redlands. During the passenger era the track continued east in the center of the road. At Orange Street the track made a right turn and went to downtown Redlands. Excellent update. If I understand you correctly, the scar in the road to the right indicates the original alignment of the main and the camera is located just inside of what was once a switch point that has been permanently re-aligned for a curve. Might there still be buried evidence or has it all been developed?